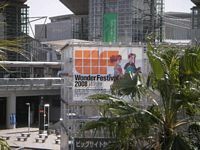 The Winter WonderFest 2008 took place at Tokyo Big Site on Sunday 24th February 2008. Thanks go to MWer SaveRobotech for attending and kindly taking and supplying the following photos to Macrossworld. First up are photos of the Macross 25th Anniversary Museum booth featuring new Macross Frontier related products, what looks to be a staggeringly accurate Minmay by Yamato, a veritable museum collection of Macross toys past and present, and keep your eye peeled for what appears to be a test sculpt of a 1/60 VF-25 from Macross Frontier by none other than Bandai! NEXT are photos of the Yamato booth featuring the upcoming 1/60 YF-21 w/Fold Booster, 1/200 scale Macross VFC figures, 1/60 DESTROIDS! from Yamato, pics of the upcoming 1/60 VF-1, and pics of the new Yamato GN-U Macross toys! For more information on the upcoming Yamato YF-21 and GN-U toys, see the Yamato Toys page.